The right boots to deal with slick and muddy trails is a key for any seasoned or beginner hiker. Half the time, the weather and conditions can change from the time you start hiking to the time you finish, making versatility a must. When dealing with muddy, wet environments, or simply the occasional stream to cross on your hike, the need to keep your feet dry is of utmost importance. But with so many choices, making the best decision on which pair to purchase can be tricky. In this article, we have researched features, prices, and gotten real field feedback in order to find 5 amazing boots that will surely get the job done. All of these boot options are sold as waterproof and were selected as the best pick for each category; The Best Overall, The Most Affordable, our Lightweight Performance pick, The Most Outstanding value, and our Stylish Function Pick. These great options will help guide you to the perfect purchase for your next hiking expedition. With no further delay, here are our picks for the best waterproof hiking boots on the market right now. These beautiful lace-up waterproof leather boots are handcrafted in Italy. They secured our Best Overall Pick by offering high quality, beautiful style, and the most features. Their over-the-ankle waxed full-grain leather uppers cover calf leather collars and are treated with Hydrobloc to maintain strength. Inside is a Gore-Tex membrane which offers complete waterproofing, yet breathable protection from the elements. These boots provide a roomy toe box and comfortable wrap. They feature are Vibram outsoles with wide lugs and a rocker designed for both mobility and braking. The midsole is constructed of dual-density polyurethane encasing a nylon shank for support on steep terrain. The Zamberlan Vioz Lux GTX RR Hiking Boots weigh in at just under 4 pounds and include 2 sets of laces. They are beautiful shoes that include everything needed to take on the most challenging of adventures. The only problem is that they look so good that you might be bashful to break them in, but once you do they will have a classic, timeless look and should last for a very long time. It’s always hard to pick a winner for the Most Affordable category, because there has been a flood of cheap Chinese boots on the market lately, boots that look good at first glance but just don’t hold up. Here, field testing is most important as cheaper boots may appear to offer a decent amount of features, but that only counts if they are sturdily built. 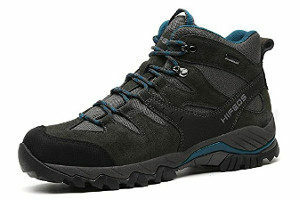 The HIFEOS Unisex Waterproof Hiking Boots have made a lot of fans as an excellent discount option. These boots would clearly not be recommended for extreme hikes or for someone who wanted to wear a good pair of boots for five years, but remain a great pick for less challenging or casual treks. They are made of suede leather and fabric mesh ventilated uppers, with a one-piece tongue. Inside they feature Uneebtex membranes for breathable waterproofing. For protection on the trail, they are constructed with a toe cap and an anti-slip rubber outsole. The lace-up closure makes for a secure fit and the bellow tongue is well designed to keep any debris out. Weighing in at just over 1 pound, these mid-height hiking boots secure our Lightweight Performance pick. 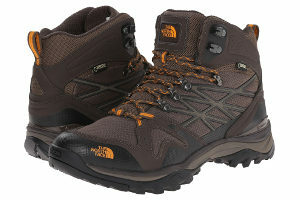 For hikers looking for an airy shoe with rugged durability, these are a great choice. They are constructed of waterproof leather, fabric, synthetic uppers and offer a traditional lace-up design with a bellows tongue to keep out dirt and moisture as well as removable insoles. They feature a high-grip rubber sole with air cushioning in the heel to provide extra support. 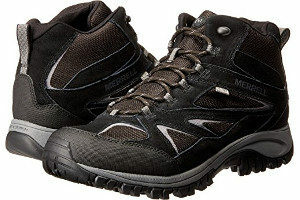 Field tests suggest that Merrell’s Phoenix Bluff hiking shoes offer a comfortable, wide fit, and the light nature of the boots makes them great for those strenuous hikes where you might also been wanting to move at a good clip. They are also an affordable option, with fewer high-end features, but excellent overall construction. We have long enjoyed the Merrell brand, and for three decades have found Merrell to be a go-to all-season brand for us, so we have absolutely no problem recommending the Phoenix boots. Choosing our Outstanding Value pick involved checking out products that offered many quality features for the best possible price, whereas the Most Affordable category above was purely looking for a decent entry-level boot. When it came to a good value pick, the North Face Hedgehog Fastpack fit the bill for a very good boot at a price that we felt was a great buy. They are a mid-height, over-the-ankle boot featuring a lace-up design and weighing in at around 2 and a half pounds. The uppers are constructed with polyurethane-coated leather and a breathable textile mesh for ventilation. 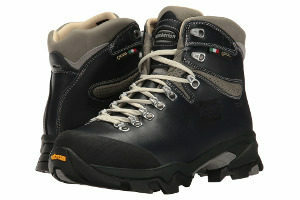 They are equipped with rustproof hardware and waterproof Gore-Tex membranes. Vibram rubber outsoles provide strong grip while dual-density midsoles with Cradle Guide supports and stabilizes your feet. Inside the shoe are Ortholite footbeds for maximum comfort that is constructed to last. 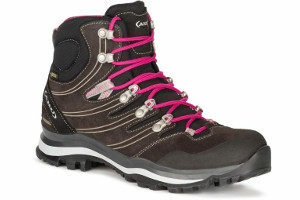 These boots offer a whole lot of bang for your buck and are a great asset for long hikes. Our last category is for Stylish function. While we know Style preference varies from person to person we found these pair of hiking boots stood out for not only their great look but what they offered as well. The AKU Alterra GTX Hiking Boots weigh 3 pounds, so they are definitely on the heavier side and are a lace-up, over-the-ankle style pair. The uppers are made from a suede leather / synthetic combination with a Gore-Tex inner membrane to ensure breathable waterproofing. The gusseted tongue blocks trail debris and the eyelets feature rotating pulleys to allow quick adjustment. Rubber toe caps offer forward motion protection and These boots also feature AKU’s Elica Fit technology, which can reduce foot strain and fatigue. Their Vibram rubber outsoles offer good grip and polyurethane midsoles for support. This is an excellent design for the stability and control any hiker needs for rough terrain. This pair of boots are handmade in Europe and come with two sets of laces. If you are looking at getting outside on a potentially wet trail, whether you are carrying your rod and tacklebox to your favorite fishing spot, or simply exploring one of the great state park trails in your area, don’t skimp on the footwear. Good hiking boots and shoes are key, and being prepared for wet conditions will help you make the most of your time outside. When is the Best Time to Visit Maine?